Happy Earth Day! It's time to celebrate a little for my favorite planet – Earth. Probably your favorite planet too. Sure the other ones are interesting to read about and look at, but this one is our home, this one is our place we've spent our entire existence. Let's celebrate it today by doing something to keep it green, clean and happy. Personally I don't think we should dedicate only one day to this wonderful planet. We should consciously do a little something for it every day to keep it a healthy planet. If you see garbage when you're walking along, pick it up. If you don't need to be driving somewhere or you can use public transportation to get to your destination, use it. Think about the Earth before you do something that might be environmentally unhealthy. 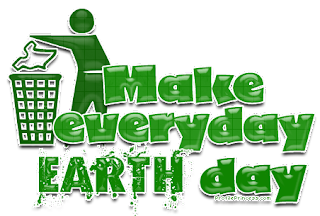 Earth day was found in 1970 on April, 22 by Gaylord Nelson, then a U.S. Senator from Wisconsin after witnessing the massive oil spill in Santa Barbara, California in 1969. Senator Nelson announced the idea for a “national teach-in on the environment” to the national media; persuaded Pete McCloskey, a conservation-minded Republican Congressman, to serve as his co-chair; and recruited Denis Hayes as nation coordinator. Hayes had built a national staff of 85 to promote the events of Earth Day across the land. On that April 22, 20 million Americans too to the streets, parks, and auditoriums to demonstrate for a healthy, sustainable environment in huge rallies going from the east coast in America to the west coast. All the people of the 60's hippie revolution protesting oil spills, polluting factoreis and power plants, raw sewage, toxic dumps, pesticides, freeways, loss of wilderness, and the extinction of wildlife all suddenly realized they had something in common with these protesters against the deterioration of the environment. The first Earth Day led to the creation of the United States Environmental Protection Agency and the passage of the Clean Air, Clean Water, and Endangered Species Acts. As time went on and 1990 came along a group of environmental leaders asked Denis Hayes to organize another big campaign. This is when Earth Day went from an American celebration to a global celebration, mobilizing 200 million people in 141 countries and lifting up all the environmental issues across the globe. Earth Day 1990 boosted recycling efforts worldwide. Earth Day 2000 combined the eagerness of the first Earth Day of 1970 and the grassroots activism of Earth Day 1990. This time focusing on global warming and pushing for clean energy. With 5,000 environmental groups in a record of 184 countries reached out to hundreds of millions of people. In the 2000's with the internet rising they used the internet to organize activists, in Gabon, Africa there were talking drum chains that went from village to village, and hundreds of people gathered on the National Mall in Washington, DC. Earth Day of 2000 was heard loud and clear by the world leaders that the citizens around the world wanted quick and decisive action on clean energy. Earth Day 2010, much like 1970, came at a time of great challenge for the environmental community with many climate change deniers, oil lobbyists, disinterested public, and a divided environmental community all contributed to a strong narrative that overshadowed the cause of progress and change. Even with such a challenge, for it's 40th anniversary, Earth Day Network reestablished Earth Day as a powerful focal point which people could demonstrate their commitment in keeping the Earth clean and healthy. 225,000 people gathered at the National Mall for a Climate Rally gathering 40 million environmental service actions towards it's 2012 goal of A Billion Acts of Green®, which launched an international, 1-million tree planting initiative with James Cameron (Avatar director) and tripled it's online base to over 900,000 members. With so many nay-sayers and people that don't seem to care about the environment take a moment and just see what you can do to help make Earth a better place. Make it a place that is there and healthy for your kids, and your kids kids, and for as long in the future as there are humans on the Earth. Don't make it just a one day event that you care about the Earth, make it an every day event, and little every day is better than none at all. If everyone does a little every day it adds up to be a lot for each day. Don't fight against wind energy or solar energy, fight for it. Let's work on keeping this planet we call home clean. I've heard too many people say things that are very self centered when it comes to the environment and it's health where they don't care about it as long as it's fine while they're alive. To me that is horrible and no one should have that feeling. If attitudes like that existed in every single person there is a possibility that this planet would have been destroyed all ready with pollution and waste. Earth Day is a great reminder that we need to step out and do something for our planet. In the comments below let me know if you went out and did anything for our home for Earth Day, or if you usually participate in keeping the world cleaner and healtheir. We recycle everything we possibly can, but our town doesn't pick up. We fill up our old van and make a trip to the next town to deposit everything. There's talk of bringing recycling here, but it's going to have a monthly charge. So it depends on the price of gas versus home pickup, I guess.